1. Preheat the oven to 180ºC, gas mark 4. Halve the pears and scoop out the cores using a teaspoon. Place, cut-side up, in a large roasting tin so that they all sit in a single layer. Scatter over the demerara sugar and then pour the wine or apple juice into the bottom of the tin. 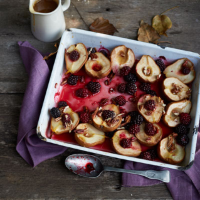 Roast for 25 minutes then, 10 minutes before the end of cooking, scatter over the blackberries and pecans and continue to bake until the pears are tender and the blackberries are softened, releasing their juices, and the pecans are golden. 2. To make the sauce, place the butter, sugar and golden syrup in a saucepan and gently heat for about 5 minutes until the sugar has dissolved. Remove from the heat and stir through the cream. 3. Place 2 pear halves on each serving plate and spoon over some blackberries, pecan nuts and juices from the roasting tin. Serve with the butterscotch sauce. This recipe was first published in Wed Jul 31 15:05:31 BST 2013.